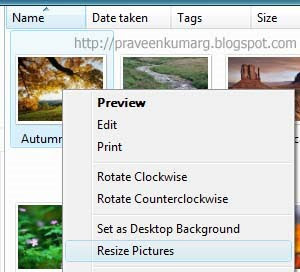 Image Resizer Powertoy Clone 2.0 is the simplest tool resizing images in Windows 7.Its functions are similar to Image Resizer Powertoy which we use in Windows XP. What does the powertoy do? Image Resizer Powertoy Clone for Windows is set up to integrate seamless with the operating system’s graphical user interface(GUI). In this regard, users will be able to easily access the Powertoy via Windows Explorer, namely right-clicking on an image and selecting the Resize Pictures option from the contextual menu that will pop up. The Powertoy delivers batch resize capabilities, being able to handle multiple images at a time. The tool permits users to create copies of the pictures resized and to store them in the same folder as the original images. But in addition to the default settings, Image Resizer Powertoy Clone for Windows also comes with Advanced options. In this regard, the tool also allows end users to enter their own custom resize dimensions. Additional options include setting in place a restriction so that images can be resized to a smaller dimension, but never a larger one, and that no copies will be created, with all changes being applied to the original files.